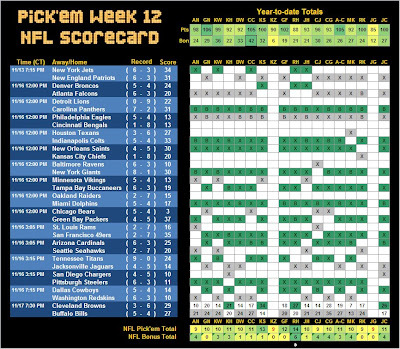 The NFL piece of Pick'em has been restored now too. The Eagles/Bangles game ended in a tie. From a Pick'em score perspective, it's just a push. From an aesthetics standpoint, I just wanted to let you guys know that I'm NOT altering the scorecard to show the tie in the record.